UPDATE – The seller pulled the original listing for some reason, but has relisted it here on eBay. How high will it go? 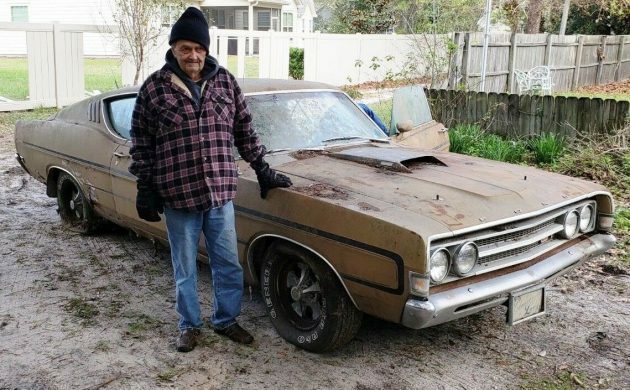 FROM 1/30/19 – This car’s next owner would be wise to invite the seller to share some stories about this 1969 Ford Torino GT over a family-diner lunch near the car’s Myrtle Beach, South Carolina location. Just say “I’ll have the Special!” So often we see cars like this on a trailer, one or more purchases removed from their history. Joe Flipper often figures less known about the car equals more plausible deniability. But here we see the husband of the Torino’s original buyer, obviously taking some pride in decades of ownership. You can write the next chapter of that legacy with a high bid here on eBay, where more than ten bids have driven the market value north of $1700. Based on the car’s originality and the 428 Cobra-Jet mill, higher offers should be expected. A vigorous cleansing (well done, seller!) may have led to water ingress creating fog inside. Rusty edges suggest the tin-worms have had their way with the sheet metal since the car was sidelined in 1975. I’m no fan of the Keystone style mags, but period-correct wheels should be easily sourced. 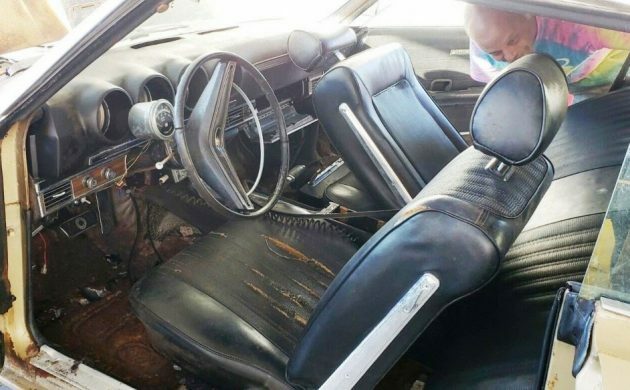 The original-looking interior shows its sporting side with molded instrument pods, add-on Tachometer, center console, and ubiquitous Radio Shack inline fuse dangling under the dash. The shiny circle on the brake pedal indicates “DISC BRAKES.” This factory AC car came equipped with (what should be a C6) automatic transmission. Parked with a mere 46,000 miles on the clock, this mid-sized muscle car barely had a chance to terrorize the byways of South Carolina before being taken of the road for reasons unsubscribed. No mention is given of whether the engine or drive train parts are original, though it seems likely based on the story. While the engine code is listed as “0” it does appear in the picture to be a “Q” as appropriate for the 428 cid Cobra Jet or “CJ” V8 with the four-barrel carburetor (thanks to the VIN decoder at tpocr.com). 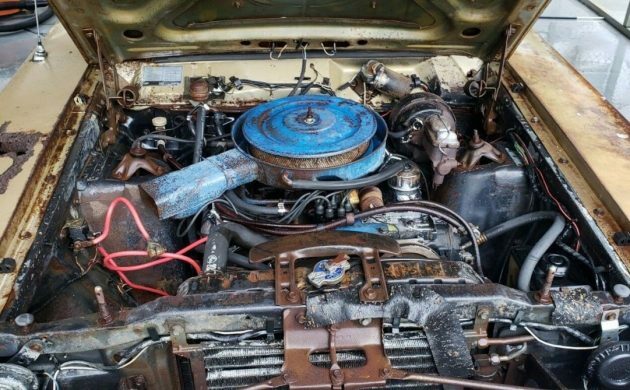 The history page here on Hemmings.com claims the Q-code (non-Ram-Air) 428 made a healthy 335 HP. 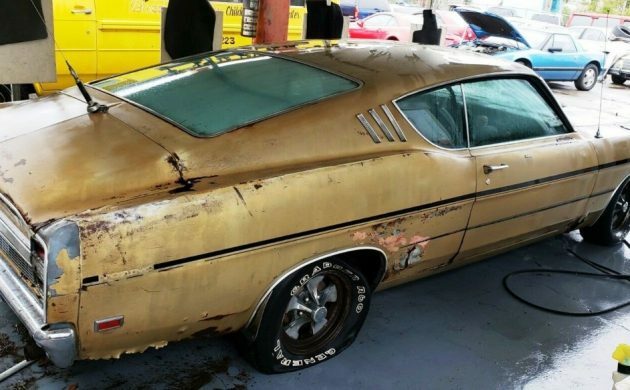 What’s your top bid for a chance to put this Torino back in the wind? This would be a good one to buy for the title, unique parts and then transplant that onto a chassis that is not scrap metal. If it’s been in Myrtle Beach all of its life it may break in half when you winch it onto the trailer! Never re-vin a car, period! It’s really not that big of a deal. People do it all the time with hot rods. I have done it.Changed the vin that is.. In California, does that make a difference? 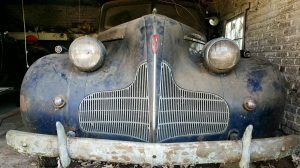 1939 Desoto with Nebraska plates. Drugs are illegal too but that doesn’t seem to worry anybody ! Seller recommend’s having a donor car to successfully repair the rust issues on this one. 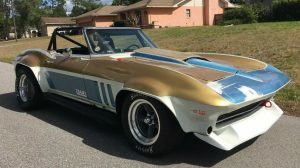 Great car’s and would love to have one, but this one sounds like about 600 labor hours to bring back..
Big block Torinos are awesome and this classic is worth restoring, it would look great with the gold paint and black stripes shining again! You can’t get much closer to the ocean than Myrtle Beach without being IN the ocean. Explains the rust. There are some odd points with the story. While the CB is 70s, the (cheap) cassette/radio dates from the late 90s to 2010 or so. Also, the seat shows well more than 10 years/45k of wear. The rust will make this o e a challenge also. Hopefully someone saves it. A nightmare at every turn of your wrench! Parked with 46k miles and left to rot? Hmmmm, I’d spring for that diner meal before pulling out my wallet on this one. Something seems pretty fishy here and it aint the clam chowder. I see 146K miles of wear; I don’t care WHAT the seller claims. I’d pass. Spend more, and buy a better car to start with, like a Mustang. It’s already over five grand with six days left. I have a feeling it’s going to take a lot more than that! I’m guessing 12 grand. Make that 12 grand, and one FOOL for a buyer. One must wonder how many hurricanes and floods this poor car has gone through – probably not even much of a parts donor anymore. The big problem with this car is a few years these had a nasty habit of rusting out up inside the firewall, which would make the body flex like it was hinged. Whoever is looking at this one needs to look at this real carefully and jack it up to see if it has this affliction. The ironworms never sleep. Good luck to the new owner. the engine is worth some serious coin if its a real CJ!! These cars were a riot to drive. I had a Cougar with the 428CJ and regret ever selling it. The rust though.. good lord, I’d have to say I’d take the motor and go hunting for a car in need. The engine alone is worth the buy it now price. The 428cj. Is a power house. And, very under rated in the horsepower numbers. The engine alone is worth the buy it now price. The 428cj Is a power house. Very few built and fewer exist. Where was it parked, at the bottom of the ocean? Park this one right next to Miss Belvedere and dream on! Why do people do this to a nice car? In 1975 he should have just junked it and be done with it. 46000 miles? Maybe once around. The car looks to worn out for such low mileage. Look at the interior. It doesn’t show near so much wear.The sea air could do that to the body in 5 years. Before retiring in ’14, I worked with a guy who had bought one of these new in 69, but his was a 390 4 speed. He retired a few years before me, and at the time, he still had it. He said that he’d replaced the quarter panels once. A year or so ago, I heard that he’d sold it. It was pristine, and I’ll bet he got a very good price for it. His was also Lime Gold, and his last name was Miller. I don’t remember the exact configuration, but his license plate said something like Millrtym. The colour of this one is champagne gold. I can just picture how many interested people knocked on this guy’s door and he refused to sell the car. Now, he wants to put it in someone else’s hands before it’s “too late”. Sorry to say, that time has already come and gone. 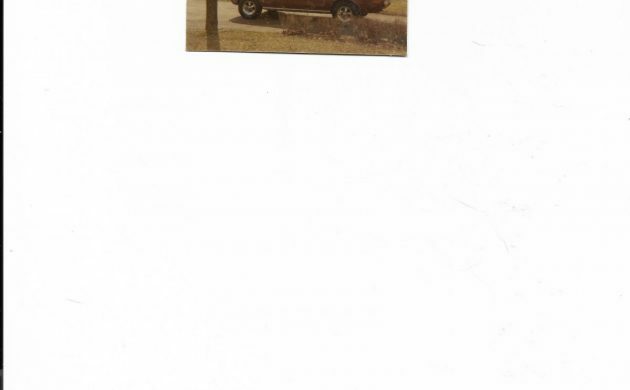 I bought a notchback version of this car in the summer of 69 with a 4 speed. It was a fun car to drive. Mine was the super cobra jet model with the drag pack. I specified the 4.30 gears rather than the 3.90’s which was the other option and with the tires it came with was way to much gear. I eventually put a 3.00 or close to that gear in it. I think it had about 70,000 miles on it when I sold it for 475.00. After I had the dist recurved it went 103 mph in the 1/4 in the low 14’s. 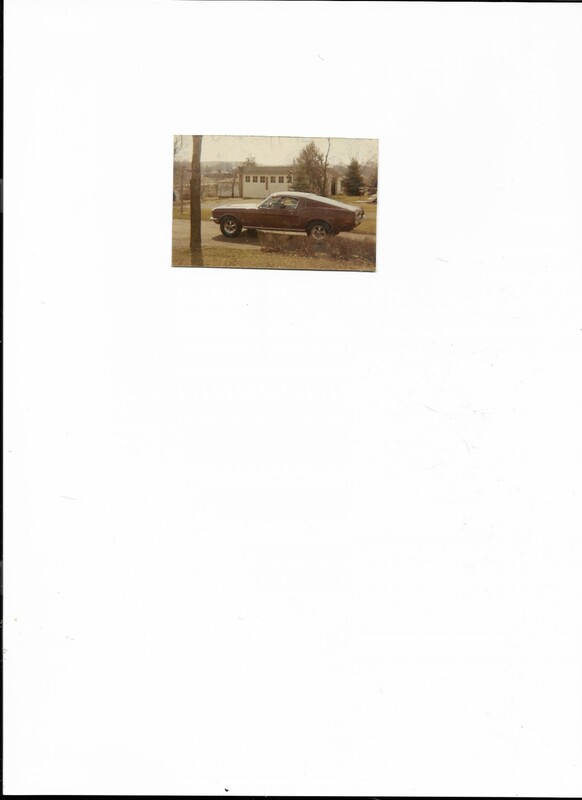 It was a daily driver all its life that I would drive to the dragstrip occasionly. My friend still has one and he is the second owner and it is for sale and it is much better than this one. Those times you got, before or after the gear swap? Sounds like a great car you had and I always have liked the notchback style over the fast back for some reason. Looks like gold paint on the rubber bumpers for the hood to sit on. Possibly been painted. Also looks like they just washed off all the water damage. Including the inside floor. Gonna need a lot of insecticide to kill those rust crickets ..
That was before I changed the gears and I don’t remember what I did with the traction lok rear end that I took out as I just changed the third member. Always liked the dash design of these Torinos. An air conditioned car with that much back glass and a black interior must have still been miserable in SC by the ocean. Friend had the coupe (notchback) version of this car and it had acceptable performance even with an auto. Keystones look period-correct, didn’t know they sold them with separate trim rings to complete the look. you’re kidding about trim rings I hope . Any Keystone I’ve ever seen had steel wheel hoops & aluminum centers . Those wheels are so rusted they’ve probably painted the hoop. Parents had one of these with the 428 …was a real tire burner…sold it before my older brother turned 16 …this one is already at 25k today. Too much rust for that money !! @Steve Akker: Your parents have powerful good taste! The ‘70 Torino 429 is also considered as a tire burning kin. My brother still has one,believe me,they are fast and heavy hot-rods! The tea leaves tell me there is a re-body in this Torino’s future. Can’t see the excitement for a Q code. The R code is the money. Remember a local R code Cobra fastback when I was a kid. Guy who owned it was at the local repair shop the same one my old man used. The guy who owned the shop built many a performance car and was the go to guy. I recall the day he told the owner of the Cobra it was all he could do to it. The problem was it was too heavy. Reason I got an AMX when I decided to get wheels….and go fast! The sum total of my Torino experience was my Dad melting down the engine in our metallic brown Grand Torino station wagon while heading up to Lake Tahoe. Luckily a passing motorist had an extinguisher or there would have been nothing left. Never cared for the Keystone’s now if it had Cragar SS wheels it would be a steal! I’m just the opposite. Thought the Cragar SS with rounded corners/edges and all chrome were just bland. The Keystones with sharper edges and black detailing added a better look. To each, his own. The Standard “Error in the Listing” auction retraction. Currently up to 25K, it just goes to prove that there’s a mug still being born every minute! You just gotta love the ‘patina’ on this one, there’s more of that than paint and metal ! I’m sure you could buy a rebuilt engine plus a lot of used parts for one of these for less than $25 grand couldn’t you ? 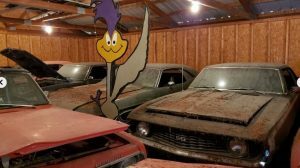 A friend had a 69 Torino that the finance company wanted to repossess. He begged them to come and get it as it had literally fallen apart in his driveway. The car was 8 years old. Maybe the Ford guys are in competition with the Mopar guys ? Craig, this Mopar guy backed out when it got to 100 bucks, we might like Chryslers but we’re not stupid, as for the Ford guys, well that’s another story! 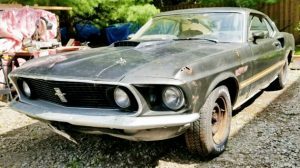 This is crazy bidding on a rough looking survivor big block car! The under-carriage must be solid to get the interest in this project,and probably never “wrenched” on,it is an original classic Cobra Jet!